From cowardly denials to fearless leader with phenomenal courage. Listen to this lesson to see how this transformation took place in the life of the Apostle Peter. See how throughout the early days of the Church Peter takes control, preaching bold sermons even though threatened by the leaders of the Sanhedrin. Find out how he was always present as new groups of people heard the gospel and accepted the message. Hear about the vision he had of non-kosher food coming down from heaven and how he learned that the Gentiles were now included in the Church. See how he is miraculously delivered from prison and continues Jesus’ healing ministry. Be encouraged that, like Peter, when you focus on the end game and the inheritance waiting for you, you can handle the suffering and trials of your own life. What are you passionate about? When you have a passion, you’ll arrange your time and money to focus on it. Listen to this lesson to learn that whatever else is said about the Apostle Peter in the Bible, we know that he was very passionate about serving the Lord. Listen to this lesson to continue learning about the life of Peter. Gain a further clarification of what Jesus meant when He talked about the keys of the kingdom. See how Peter insists he will never deny Christ but within a short time he fails miserably. After Jesus’ resurrection see how He meets with Peter first and then find out what Jesus was teaching Peter when He asks him three times if he loved Him. After this Bible class we had a special presentation by Stand With Us and two members of the Israeli IDF. Please click here to view/listen to their presentation. If you have an inquiring mind, you’ll enjoy hearing many vital questions answered about 1 Peter. Listen to this lesson to learn whom the intended audience for this book was: Gentiles or Jews. Several supporting reasons for the majority view that it was addressed to Gentiles are discussed but stronger arguments are convincing in the belief that it was intended for Jews, including terminology and the quoting of Old Testament passages. Another question concerns where Peter was when he wrote this book and historical Babylon seems to be the most likely location. Next, we ask, why was this epistle written? Based on the number of times the word suffering and words for adversity are used, it becomes obvious that the audience for the book were undergoing persecution and troubles in their life. Look forward to the encouragement and strength we can derive for our own lives from a study of this book. If you’re looking for help with how to handle suffering, adversities, and calamities in your life, you’ll find a book packed with answers in this latest study beginning tonight. Listen to this lesson to learn about the authorship of 1 Peter. External evidence verifies that the early Church fathers mentioned the Apostle Peter as being the author in a number of writings and oral presentations. Find out the many internal evidences within the book itself as events, incidents, and stylistic vocabulary are pointed out. 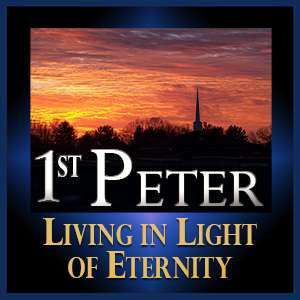 Listen to a brief biography of Peter. To get ready for the coming weeks, take time now to read through the epistle several times to familiarize yourself with its many important passages.